Although these are ancient temples nowadays you can’t see many ruins. Because of new constructions and treasurer hunters. Better attach this visit with the waterfall hunting of this area rather than a separate journey. Then you would not be desperate by seeing only few archeological values at these places. Always introduce yourself to the chief priests of temples and get their permission to visit. Public transport system is not that much good in this area. Less buses after 3pm. 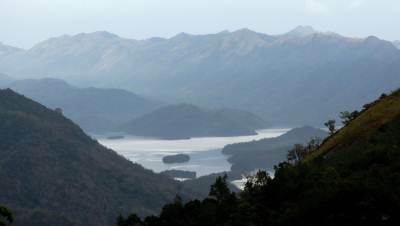 The road from Hanguranketha to Walapane under construction and would be finished in 2015. The name Hanguranketha was derived from “Sangaruwan Ketha” (සගරුවන් කෙත) due to it’s thriving paddy fields in the ancient time. 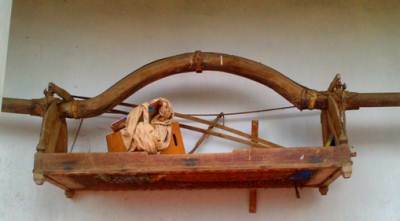 It was also called “Diyatilaka” (දිය තිලක). 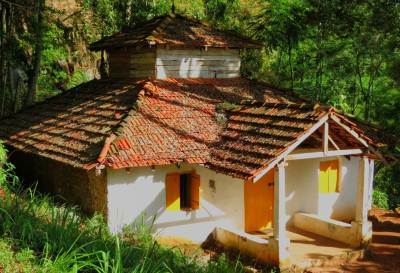 Ancient kings especially during Kandyan period have used this as a second city/camp site when Kandy was attacked. 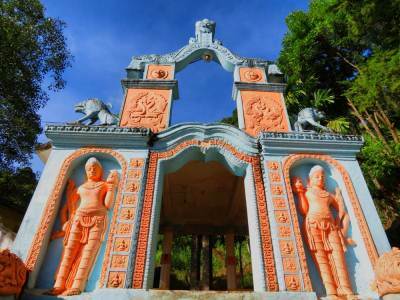 The king Senarath (සෙනරත් රජතුමා) has built the first palace in the Hanguranketha. According to Robert Knox’s records the city had been surrounded by a white washed protective wall. There was a giant wall encircling the palace. 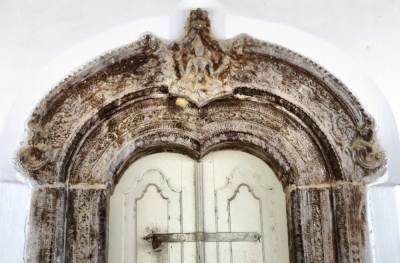 The entrance of the palace was constructed with beautiful carved doors and door panels. The audience hall of Hanguranketha was built by King Rajasingha 2 (දෙවන රාජසිoහ රජතුමා). 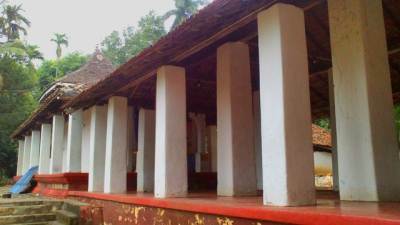 This audience hall was structurally similar to Kandy audience hall but functionally different. 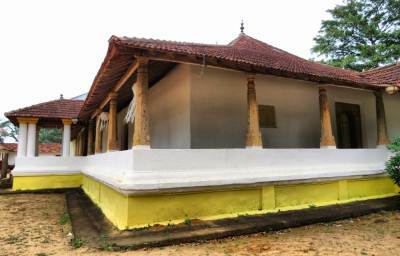 This hall was used by the king for resting and recreation activities. This beautiful city was destructed by invaders from time to time. The king Seethawaka Rajasingha (සීතාවක රාජසිoහ) has also destroyed the city in searching of Konnappu Bandara (කොනප්පු බණ්ඩාර). 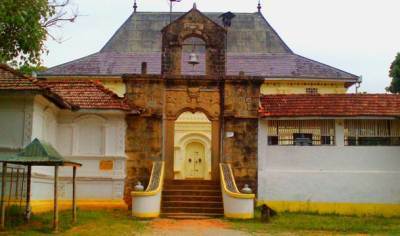 Today there are two ancient buildings can be seen in Hanguranketha. 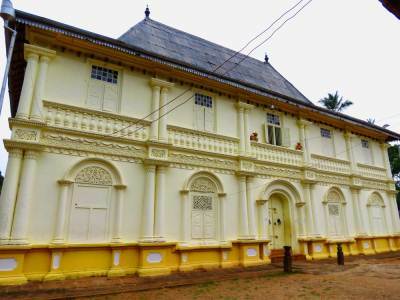 Pothgul Maliga Maha Wiharaya-built during British colonial period. 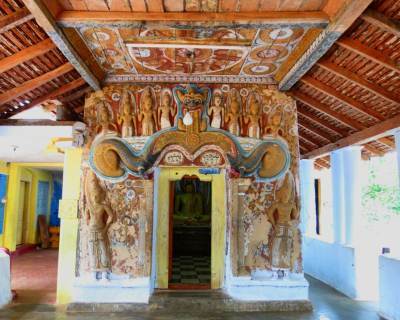 Above mentioned beautiful audience hall was located close to current Hanguranketha rest house. 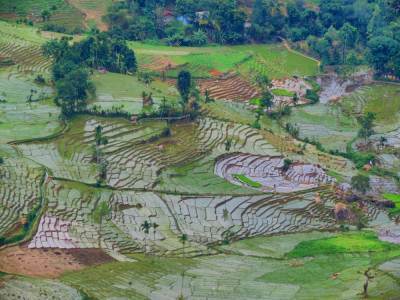 The paddy field known as Wadanapaya (වඩනාපාය) is situated at the site of ancient audience hall. Ancient Hanguranketha palace was destroyed by British people in 1818 rebellion. Remained parts of the palace were used to build this temple. Therefore it is called “Maliga” මාලිගා and because of the presence of a large library called “Pothgul” පොත්ගුල්. 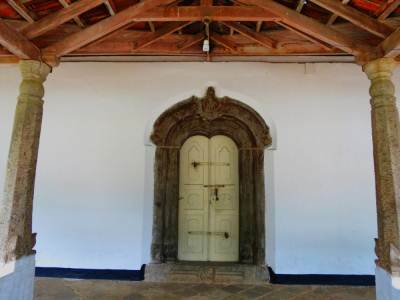 The original carved stone door frame, moon stone and stone pillars can be seen here. 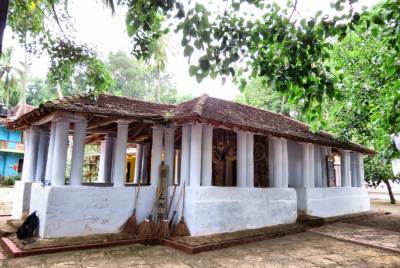 “Pothgula”/library –We couldn’t enter as chief priest was out of the temple. 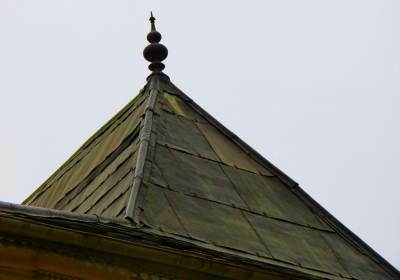 The stupa situated inside the image house is a characteristic of this temple. 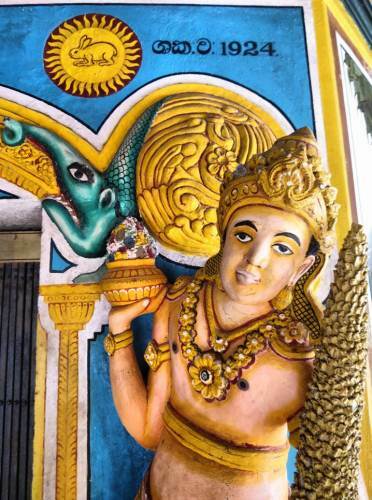 When you cross the road you may come across ancient Vishnu Dewalaya. 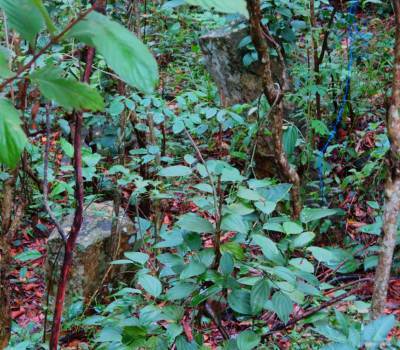 Ancient Jack tree belonged to king. 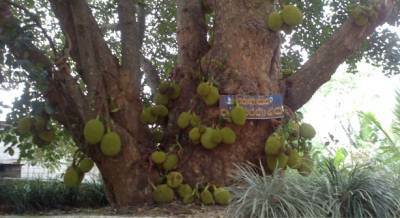 Famous joker called Andare (අන්දරේ) has eaten jack fruit from this tree. 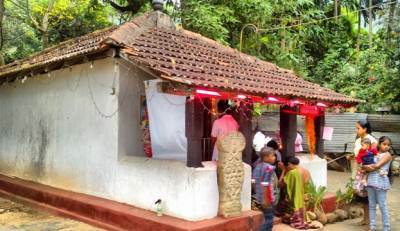 Dadimunda Dewalaya දැඩිමුණ්ඩ දේවාලය is situated behind the Vishnu Dewalaya. 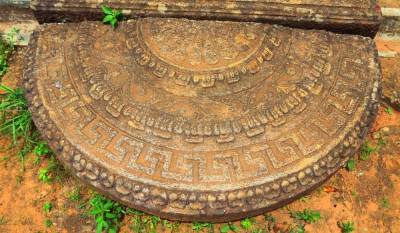 Excellent stone carve called “Pancha Nari Gataya” පoචනාරි ගැටය is situated here. 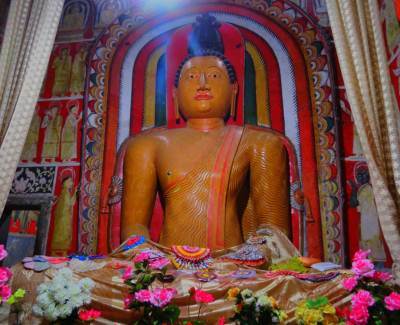 Next place of visit was Madanwela මාදoවෙල ancient temple. 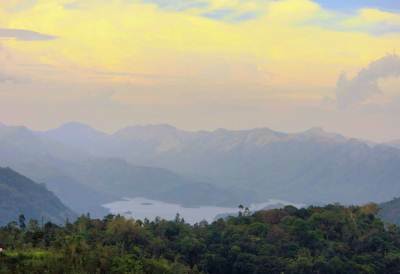 It is situated in between Hanguranketha and Rikillagaskada. Although it is an ancient temple almost new constructions can be seen. 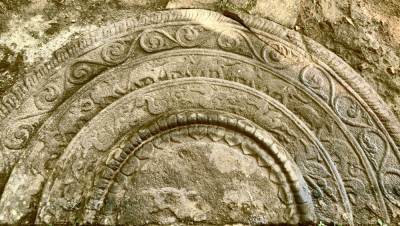 It belonged to Dambadeniya period. 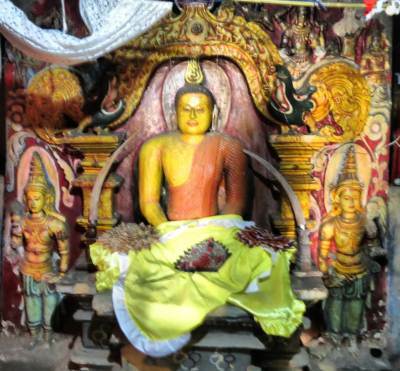 According to literature there is a gold plated bronze Buddha statue which was made according to Dambadeni tradition. (As chief priest was busy I couldn’t get any information about this Buddha statue). 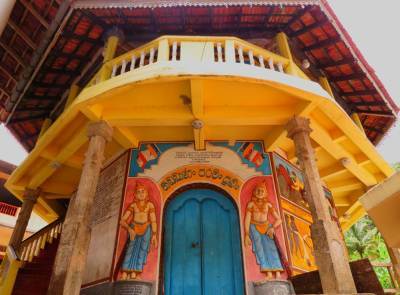 Then we came to Rikillagaskada and reached Wagama ancient temple (වෑගම පැරණි විහාරය). Wagama can be reached via Hewahata (හේවාහැට). Actually we walked from Ekiriya (ඇකිරිය) to Wagama after visiting limestone cave. 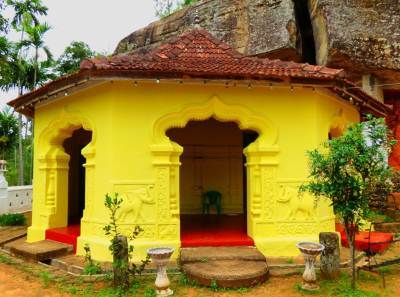 Cave temple where the statue of Henakanda Biso Bandara (හෙණ කද බිසෝ බණ්ඩාර) was placed. After destroying that statue only a drawing can be seen. Unfortunately nobody was at this temple when we visited. 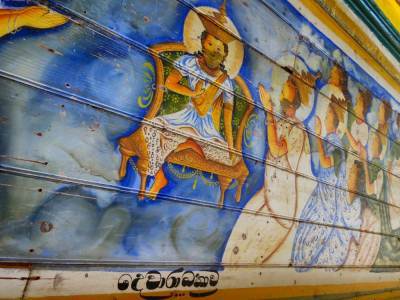 From Wegama we came to Kithulpe (කිතුල්පේ) to visit at Kithulpe Ranpathge temple කිතුල්පේ රන්පත්ගේ විහාරය. 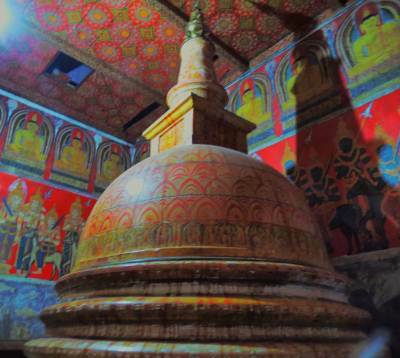 This must be the oldest temple of this area, belonged to Anuradhapura era. The name “Ranpathge” is related to Pandukabhaya (පණ්ඩුකාභය) story. 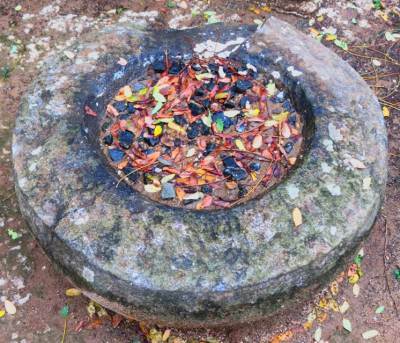 Archeologists have found pieces of clay pots belonged to Anuradhapura era at this place. 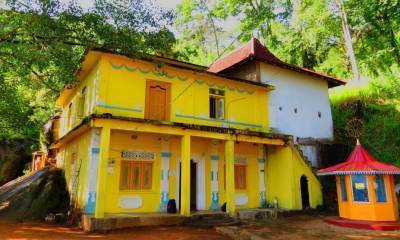 Currently you can see the image house belonged to Kandyan period and few stone pillars only. Ancient image house. New image house was built attached to this. 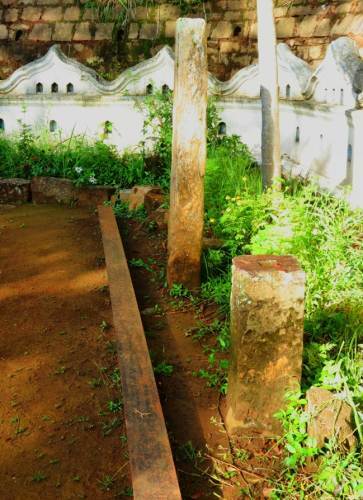 This is not the original place where stone pillars placed. 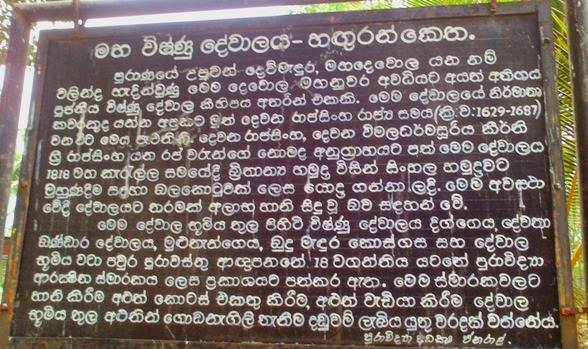 Then we came back to Rikillagaskada and reached Wilwala ancient temple (විල්වල පුරාණ විහාරය). 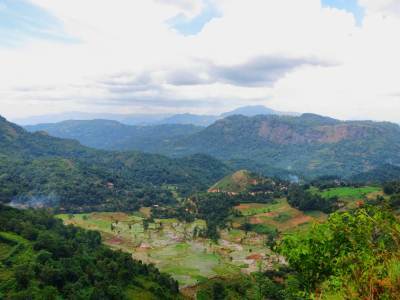 Wilwala (විල්වල) is situated on your way from Rikillagaskada to Padiyapelalla (පදියපැලැල්ල). 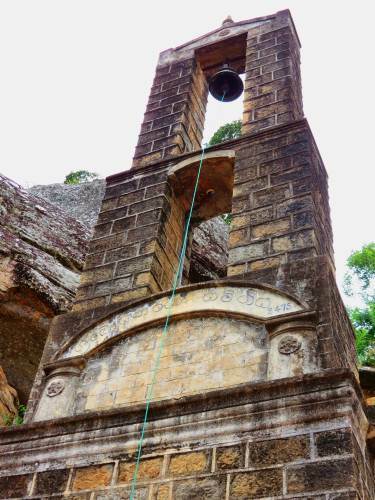 There are two ways to reach Wilwala temple. 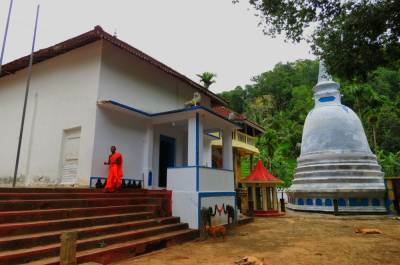 If you are going by own vehicle it is easy to go to Karandagolla (කරදගොල්ල) and drive up till Wilwala temple along the concrete road. Alternative way is to take Rutland (රට්ලන්ඩ්) bus form Rikillagaskada and get down at Wilwala. 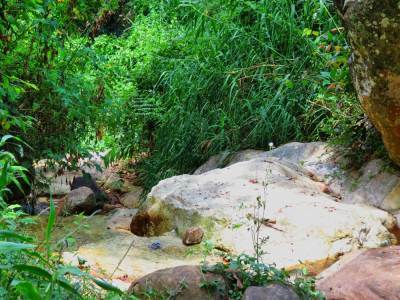 Then you can follow the foot pathway closer to the Wilwala School to reach Wilwala temple. 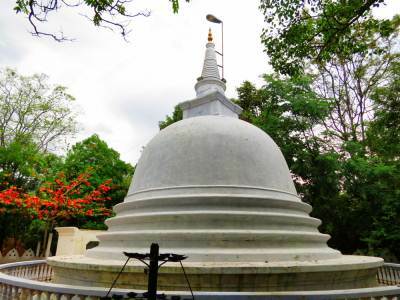 Although it is mention Wilwala belongs to Gampola period true history goes back to Anuradhapura era. 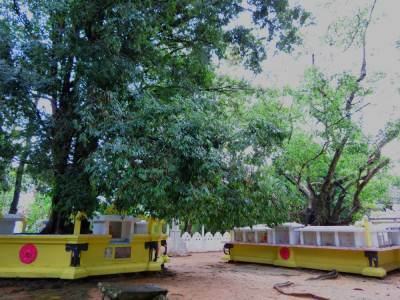 This is one of a place where “Dethispalaruha” Boo trees (දෙතිස් පලරුහ බෝ ගස්) were planted during King Dewanmpiyathissa (දෙවනිපෑතිස් රජතුමා) period. 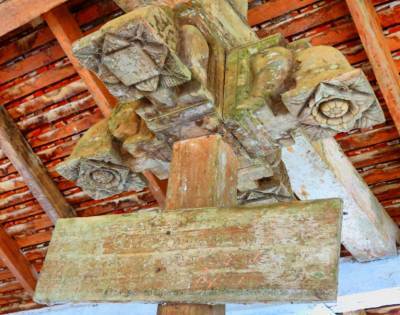 Ancient “Darma Shalawa” ධර්ම ශාලාව -It needs immediate renovation. Unfortunately archeology officers still haven’t started it. 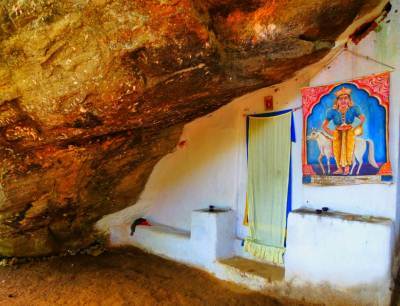 The cave where Hena Kanda Biso Bandara Dewalaya (හෙණ කද බිසෝ බණ්ඩාර දේවාලය) is situated. She was the queen of King Wikramabahu III (තෙවනි වික්රමබාහු රජතුමා) during Gampola period. 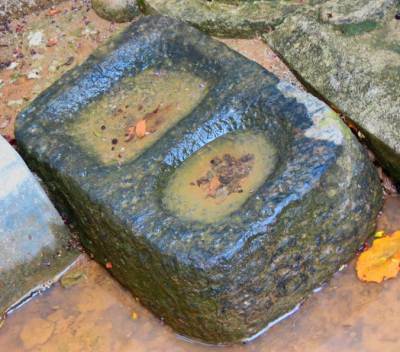 People believe this temple was built by Hena Kanda Biso Bandara Dewi (හෙණ කද බිසෝ බණ්ඩාර දේවිය). Two story image house. This is an extension of old cave image house. Right part of the upper floor was built recently. Ground floor has the old image house. This is the entrance. 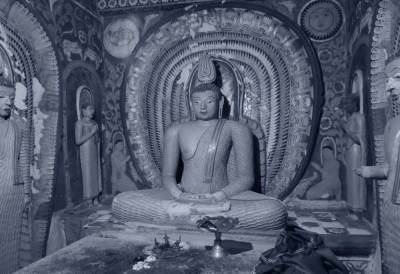 Seated Buddha statue found in the old image house. 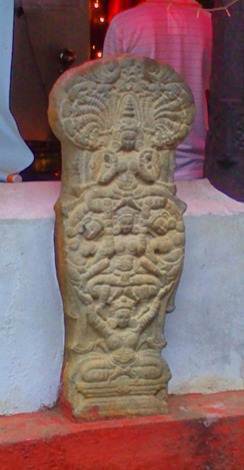 Note the Makara Thorana over it. Upper floor has two Buddha statues. One is reclined Buddha statue placed recently. This seated one must be old few decades. But it is beautiful. This stone inscription carries an important message. 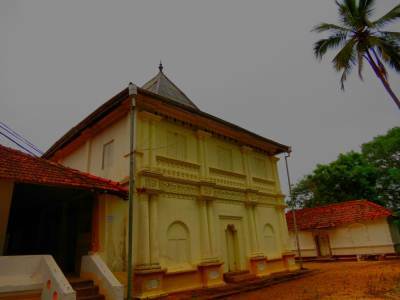 It mentions the donation of King Wijayabahu V (A.C 1344) for this temple. 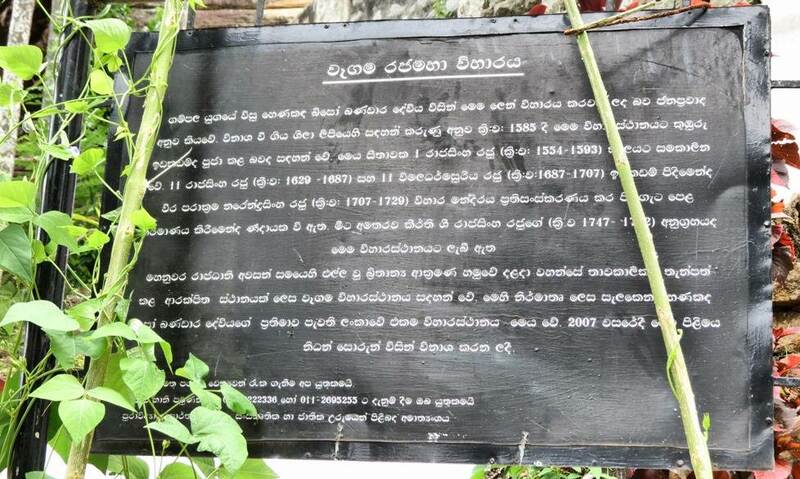 This is an evidence this temple is older than Gampola era. Following that we walked towards Karandagolla and got a bus towards Padiyapelalla. Next place was Morapaya RMV (මොරපාය රජමහා විහාරය). 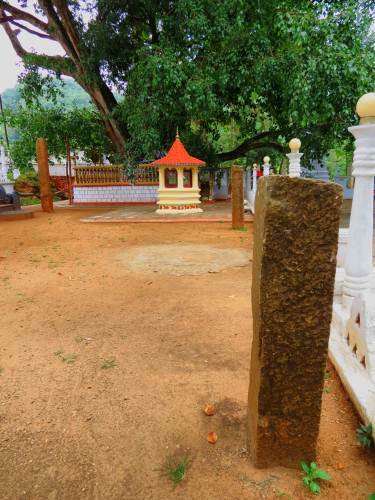 Ancient Morapaya temple is situated in Padiyapelalla-Mandaram Nuwara (මන්දාරම් නුවර) road. 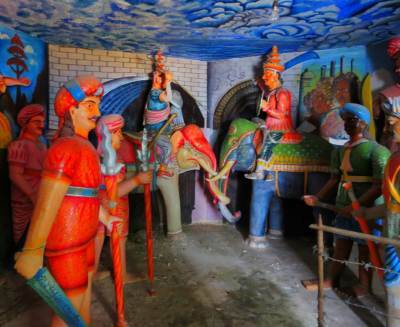 The story behind this temple is interesting. 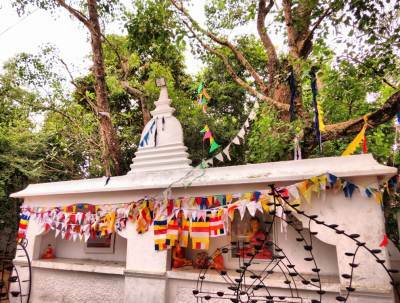 A precious golden Buddha statue can be seen at this temple. 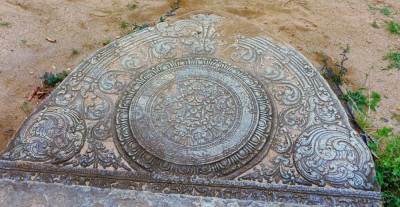 It was placed by Maliyadewa Arahath Thero මලියදේව රහතන් වහන්සේ. 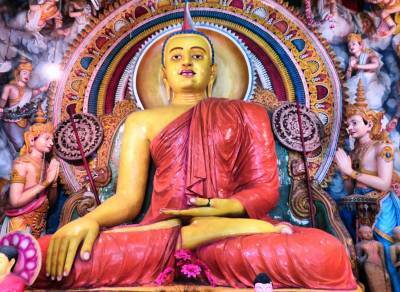 (Last Arahath Thero of Sri Lanka). 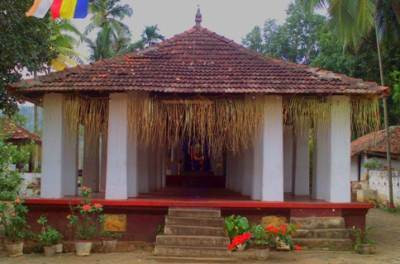 This temple is situated close to Belihuk Oya (බෙලිහුක් ඔය). 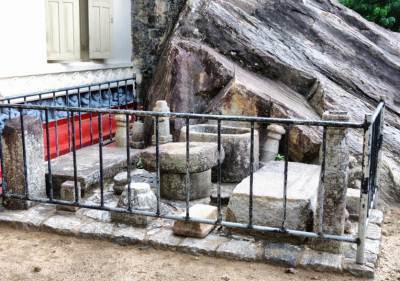 In early part of 17th century temple was destructed by a landslides and Buddha statue has been vanished. 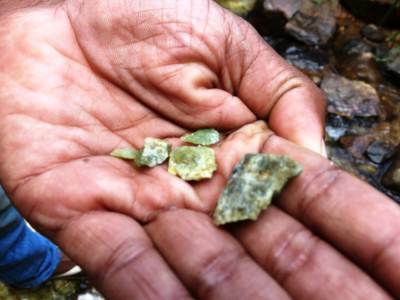 Later it was found by two merchants. Two image houses were built in different periods. This image house was painted at 1957. 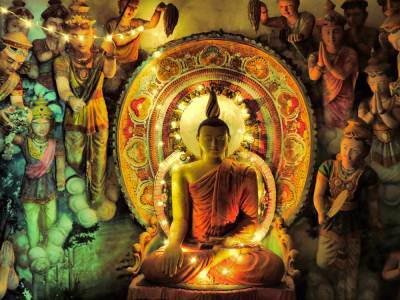 Seated Buddha statue seen in new image house. Two story old image house. 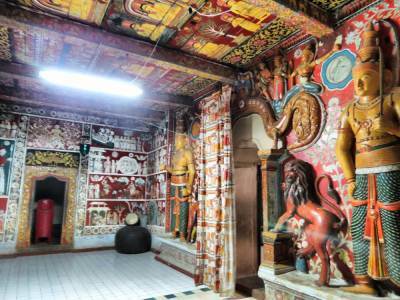 Ground floor has statues of King Dutugamunu (දුටුගැමුණු රජතුමා), King Elara (එළාර රජතුමා) and Ten giants (දසමහා යෝදයෝ) . 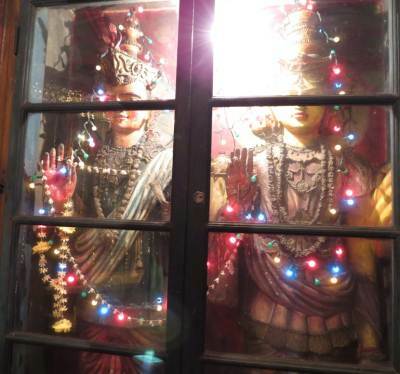 First time I saw these statues together at a temple. Moon stone only carries two elephants. 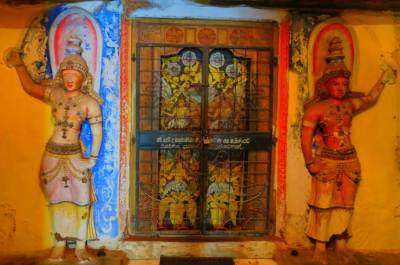 Ceiling of upper floor is decorated with beautiful paintings. 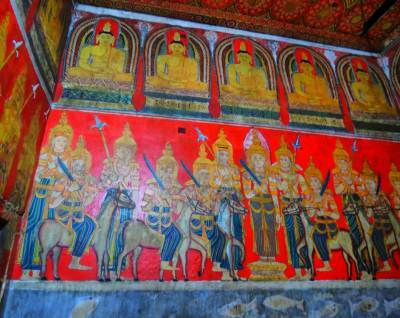 Paintings of the outer wall say the story of golden Buddha statue and this temple. Entrance of upper floor of the image house. The golden Buddha statue can be seen in upper floor. 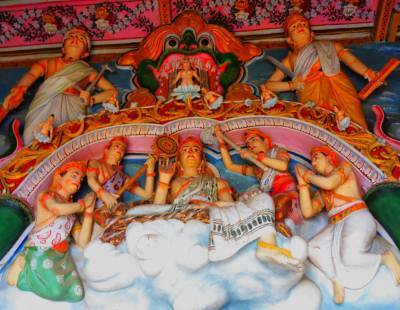 There are statues of different gods as well. I didn’t include a photo of this precious Buddha statue due to security reasons. Once it was taken by treasure hunters and later found. 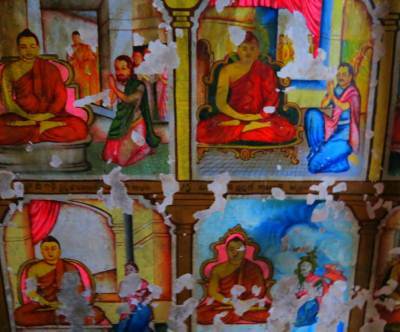 Paintings belong to early part of 19th century. 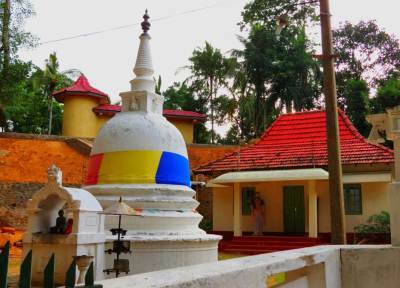 This temple is situated in Walapane (වලපනේ). Take the road closer to Walapane bus depot to reach Watarakgoda. 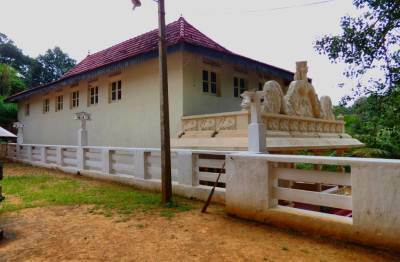 Pussadewa Thero පුස්සදේව රහතන් වහන්සේ (One of Ten giants of King Dutugamunu later became a priest following the war) has lived here. Therefore it is called Pussadewa temple. Nowadays only few scattered ruins can be seen. 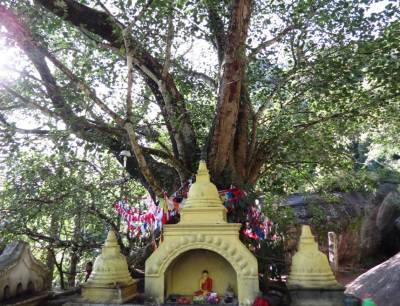 This temple has both Na tree and Bo tree together. 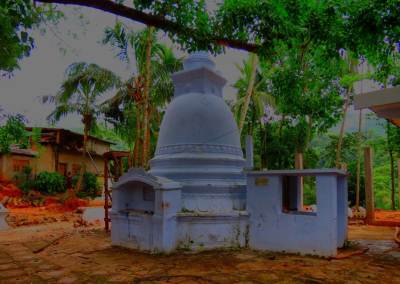 New stupa was built on ancient stupa. As this temple is not under archeology department, new constructions have been done. 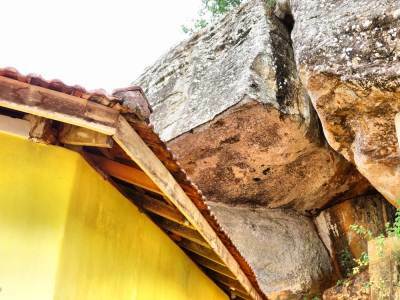 This is the largest (may be the only) serpentine rock found in Sri Lanka. First we went to Ragala town from Walapane and then reached Manthreethanna (මන්ත්‍රීතැන්න). 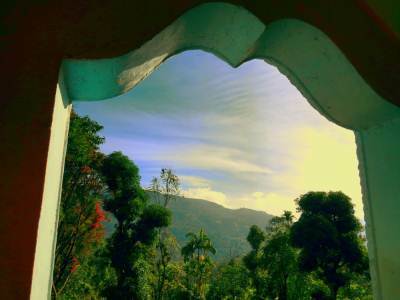 Manthreethanna is a beautiful village comes in Rawana legend. King Rawana’s poultry was at Manthreethanna. 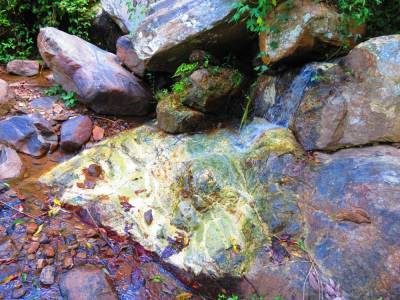 From Manthreethanna we came to Rupaha to reach serpentine rock called “Garandugala” (ගරඩුගල). 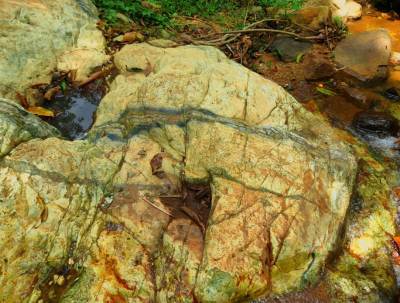 This serpentine rock covers few acres of the land. On our way back we walked to Kotambe and then came to Walapane via Neeldandahinna (නීල්ද්ණ්ඩාහින්න). You can approach Garandugala by this way as well. It is greenish in colour. True colour exposed out. 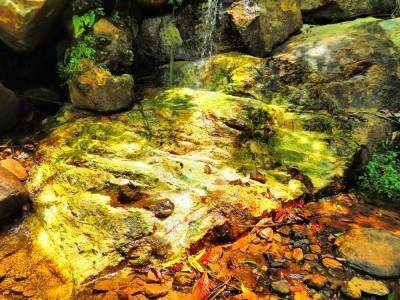 It spreads over few acres and a water stream flows over it.